Yesterday was another slow one. It’s been chilly which may have delayed spring cleaning for some. I’ve always figured that people generally get out and enjoy the first couple heat waves; it’s when the warmth loses it’s novelty that they get to work. I found this sad looking pine tree on St Hubert near Marie-Anne. The branches were mostly dead but the top was still growing. I decided to bring it back and give it a chance to come back. I gave it a hair cut! I trimmed off all the dead branches leaving only the top. I’m optimistic about this tree making it – I’ll keep you posted as to how it progresses. 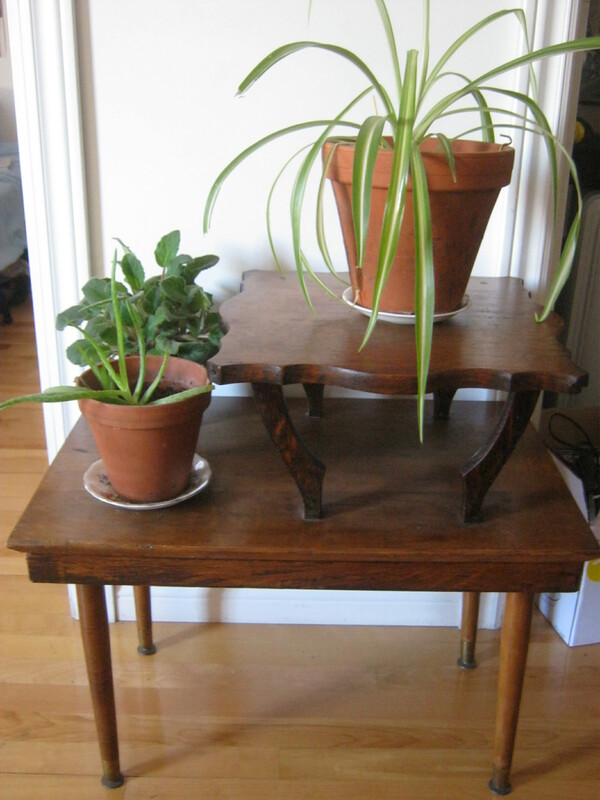 I also came across this cute side-table (and former tree). It looks like an older piece. I thought it might come it handy and I took it home after a (passed) inspection for bugs. I’m not sure what kind of wood it is but it was a bit heavier than I expected it to be. It fit perfectly in this little space. I put some plants on it and it looks great – a nice addition to the apartment! All this green talk is reminding me that I need start planting some herbs for the summer. I already planted tomato seeds (5 different varieties!) but I’d like to have some cilantro (among other things). It’ll help me eat well and cheaply – a necessity if I’m going to live comfortably during my “summer of garbage.” I also find growing things fulfilling and haven’t done enough of it in recent years. Anyways, on that note I’m going to go find some seeds! I’m thinking that spindly tree is going to appreciate being saved. Go Martin! 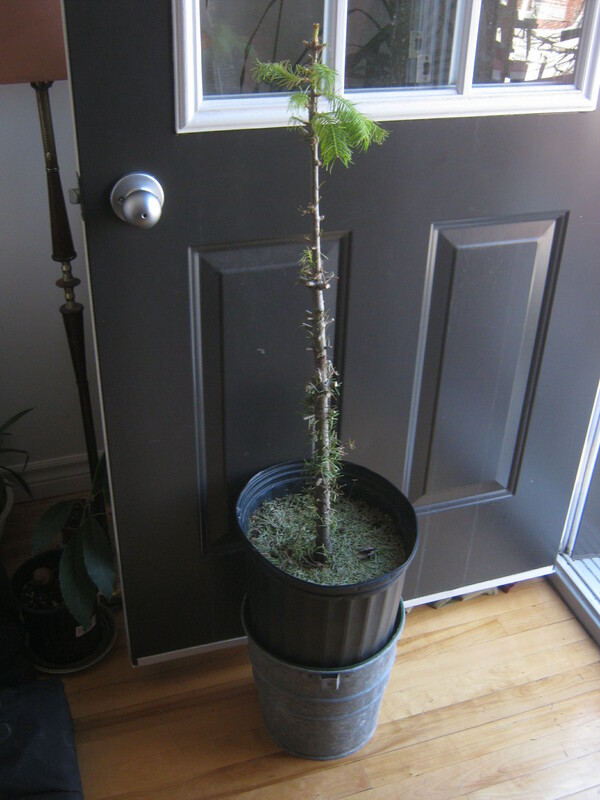 It doesn’t look like a Norfolk Island Pine, which is grown as a houseplant. Judging from the pot, it’s likely a landscape specimen that wasn’t needed. Don’t forget, bringing stray plants in may bring bugs that bother other plants. 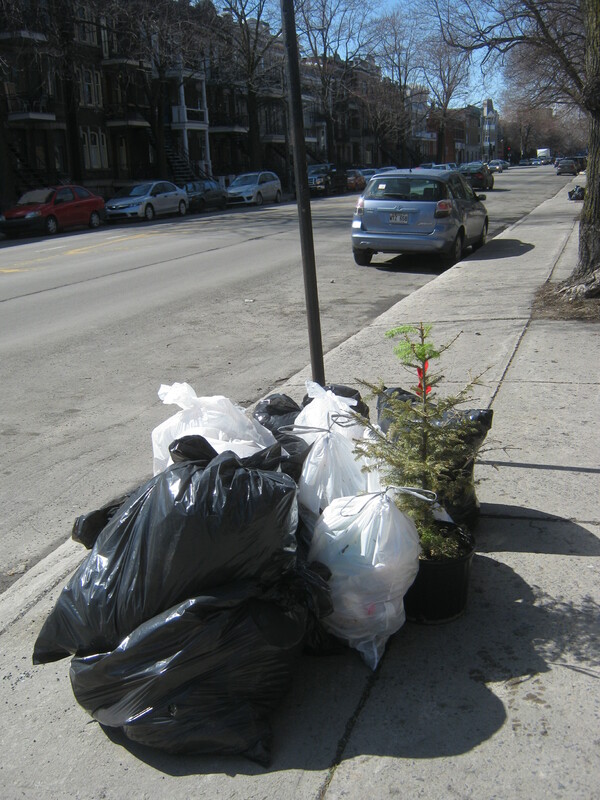 I thought I saw 2 or 3 Christmas trees in one NDG pile last week. It seemed a bit late since they seemed real. Free ice cream at Ben & Jerry’s on Tuesday April 9th, noon to 8pm. Good to remember, this one looks fine but it’s good to keep an eye out for aphids and other diseases. 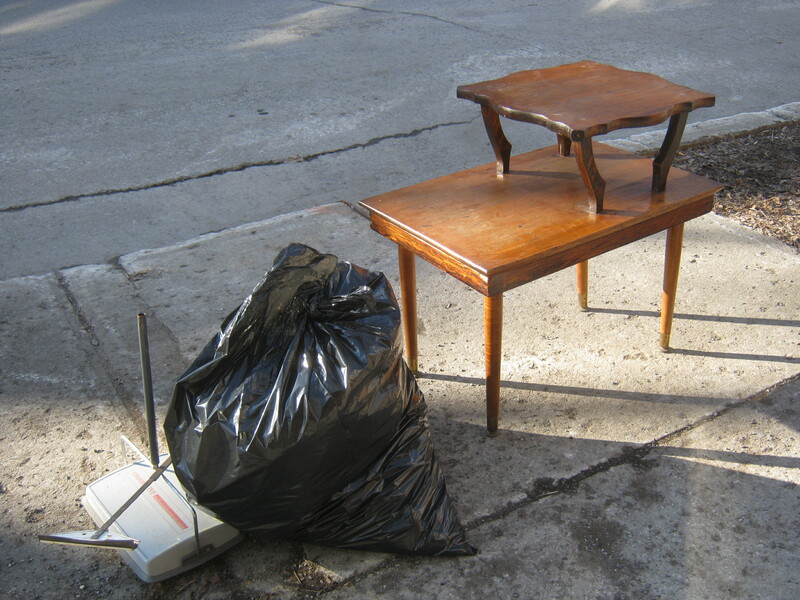 I still see Christmas trees sometimes – too bad since they aren’t collected for wood pulp anymore. I might have to check out that ice cream! You mentioned in this post that you found the tree on St.Hubert at the corner of Marie-Anne.I notice that you usually do not mention on your blog the name of the street where you find stuff.Have you foraged on the streets of Plateau East,the francophone areas—streets like Chabot,Lorimer,Fullum,Dorion,etc and found good stuff?Also have you foraged in the Little Italy section of Rosemont?Maybe there are good places for food-foraging near Jean Talon market.Readers could benefit from that.I am interested in the names of streets where you find good stuff.Enjoy your weekend. Keep me posted how your cilantro comes along. I have never been able to successfully grow cilantro. Cilantro does not like hot summers. Like spinach, the best time to grow it is in spring (with the chance for more in the fall). Sow seeds in spring once there is no danger of frost. You’ll have a garden full of stunted cilantro plants in full bloom, long before other vegetables are ready for harvest. Then in the fall, you’ll notice self-sown volunteers exuberantly springing out of the earth … and depending on the fall weather, you may get a second crop. Thank you Leeniedevinity. I will try again this spring. It seems scavenging is more common in the Plateau and downtown than in other boroughs.In other boroughs you might find a number of people driving pickup trucks and scavenging scrap metal and a few looking for cans and bottles,but not so many looking through the trash of secondhand stores and the garbage curbside pickup.If you visit other arrondissements often over the next six months,maybe you can do a cross-comparison of scavenging patterns and the quantity of garbage/treasures/reusable stuff thrown out in different boroughs.You’d be surprised,but three of the most populous boroughs in Montreal are boroughs you rarely visit-namely:Ville St.Laurent,NDG-Cote Des Neiges and Ahuntsic-Cartierville.St.Laurent is the biggest borough in size and a city unto itself.Ahuntsic-Cartierville is also a superb borough and very large—it boasts many biking paths and green spaces.You should love biking there.Post pictures of scavenging in those boroughs too on your blog.Really look forward to your adventures.Your leg muscles must be superstrong from all that biking and walking. I definitely plan on exploring more as it gets warmer. Tomorrow morning should be nice and I plan on checking out Rosemont. However I will explore further soon. First I need to get my bike fixed up a bit better. I do scavenging for novelty items,knickknacks and occasionally for bottles/cans from time to time in my borough to help the environment,to find good stuff to decorate my apartment with and to occasionally supplement my income.I tend to scavenge in darkness at night the day before garbage pickup.I do not like to be watched by many people.Do most scavengers prowl at night the day before garbage pickup or on the morning of the garbage pickup day itself?What does your observation tell you? My neighbor grows his own eggplants and carrots.I have a cherry tree and apple tree in my backyard.I give my surplus cherries and surplus apples to me.In return I get somer free homegrown eggplants and carrots every year.I am happy you are growing your own tomatoes and that you will be growing cilantro too.Exchanging homegrown fruits and foods with neighbors can be wonderful.And by the way,congratulations to you for finding and rescuing the spider plant in the trash.I find spider plants beautiful.They also make for great hanging baskets. This week is going to be warm for sure—double-digit temperatures every day.However,it will be rainy or drizzly.If you put on rainwear,you could bike far.Good luck. I hope you continue this wonderful blog past October.You may get burnout and take a vacation ,or find another job full time after October.But even if you work another job full time,I am hoping you wil continue searching for treasures in trash part time and continue posting.Ideally,I am hoping that you will become an authority on this topic,will write paid articles on this topic and will make money by selling or recycling valuable raw materials,cans,bottles and even art that you found in garbage but choose to sell.If you have a trailer or more hauling capacity,you could rescue more stuff and make more money.